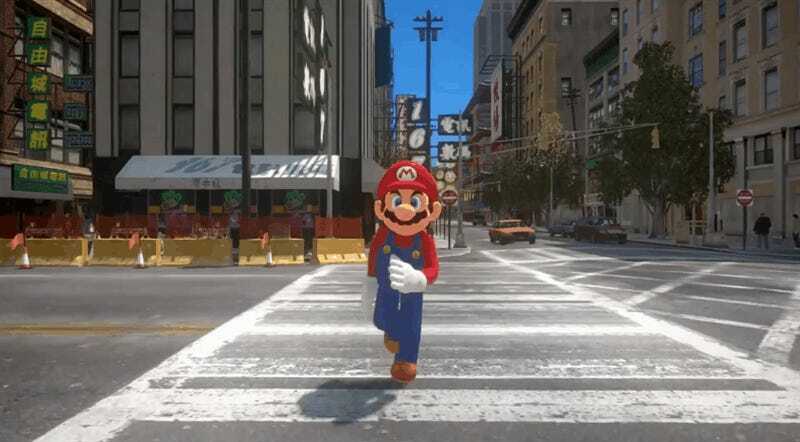 Super Mario Odyssey’s trailer was only a couple minutes long, but it was enough to get everyone hung up on was Mario’s bizarre appearance in a fictionalized version of NYC. The immediate comparison was that Odyssey reminded people of GTA, so it was only a matter of time before mods mashed together the whimsy of Odyssey with GTA’s grit. CrowbCat combined parkour and realism GTA IV mods and paired them Super Mario Odyssey’s music, and the result is hilarious. I’d play this on the Nintendo Switch. You know what, maybe it’s good that Mario isn’t as tall as the other humans. He’s got some Slenderman thing going here, yikes.